A while back, after having made several books together, my publisher friend Mauricio Velázquez de León (owner of duporess) invited me to a Skype lunch. While he sat at an outdoor cafe somewhere in Baltimore with a tasty-looking sandwich, I ate a salad in a Savannah Panera, and we talked about this and that. Before he let me go, he asked what made me tick, artistically—a very interesting question that threw me off guard, and really made me think. I love to draw cities, and kids, and animals…. but if there was one thing we weren’t already doing that made my artist’s heart sing, it had to be SHOES. During the rest of that Skype lunch and for a long while after, we talked about shoes, and how to make them into a book. We shot ideas back and forth leisurely for quite a while (one year? two?? ), and then somehow or other “The Shoe Book” made it onto a tentative production schedule. We were actually gonna do it. So, I had to write it. Now, I’m not a writer, I am an illustrator, but I can string a few words together in a pinch. With a vague idea in my head based on the amazing classic Love, Loss, and What I Wore, a book I had read years earlier, I spent a week or two typing up a charming little manuscript. Mauricio called the draft “lovely” or something to that effect, and, despite my bent toward self-deprication, I agreed with him. It was a lovely manuscript. (In keeping with my amateur writer status, it was largely auto-biographical—so predictable!) But it wasn’t a book for duopress. Not yet. After thinking about it for a while, he came back with suggestions. Duopress publishes innovative books for curious children. “The Shoe Book” had to be an innovative. Maybe even interactive. My original manuscript was very nice, but there was nothing innovative about it. I started over, converting the words into an activity book. Letting go of my original approach wasn’t easy, but I trusted Mauricio and forged ahead, trying to combine his ideas and requirements for the project with my initial inspiration. The result was more than a manuscript for an activity book, because it had a voice: there was a story, told by a little girl. Her name changed a few times but eventually became Isabella. Page by page Isa shared not only her love of shoes, but her obvious love for her family and friends, and for the process of design. 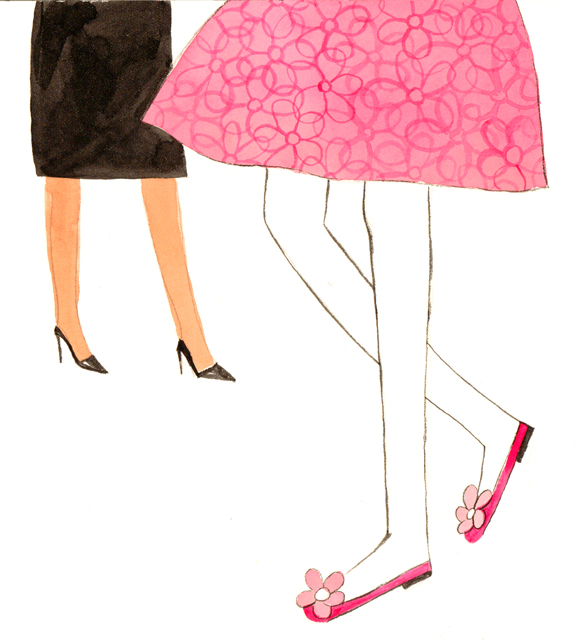 “The Shoe Book” was becoming not only innovative, but special! With a working manuscript I made some art samples, including this painting. Although this watercolor didn’t come close to making it into the book, it helped me find the look of the book. Just part of the process. Mauricio and I went back and forth revising the manuscript too many times to count, making changes even as I was up to my elbows in ink chasing that drop-dead-absolutely-final art deadline. It had to happen that way, because the book was innovative—something totally new and different—and every spread generated more creative ideas. Input from duopress’s copy editor, distributor, family friends, and our beloved designer Charla Pettingill also helped form the final product. The result: Isabella’s Shoe Studio, which will be available this fall. We will be promoting the book this weekend at Book Expo America. 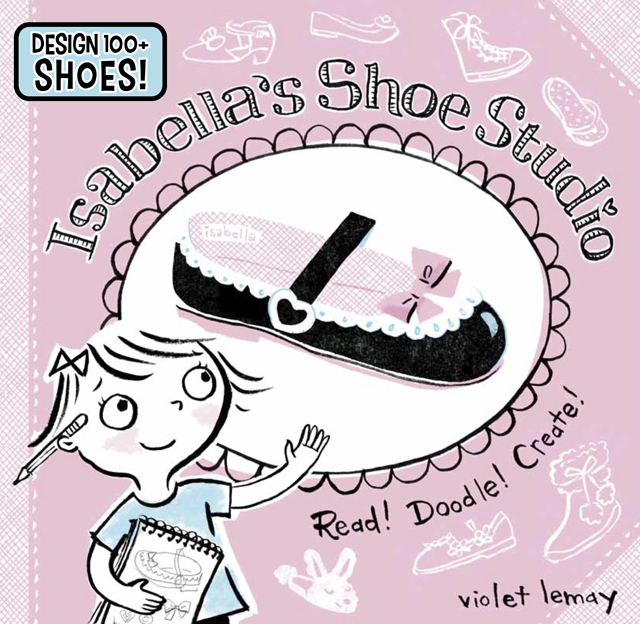 My name is on the cover, but Isabella’s Shoe Studio was most definitely a group effort, a true collaboration. The project evolved, and we rolled with it. What a pleasure. Second, for my fellow artists: Don’t be afraid to collaborate. Good ideas can always be improved, and they may die if they aren’t allowed to be shaped by smart people who are in the position to do something with them.